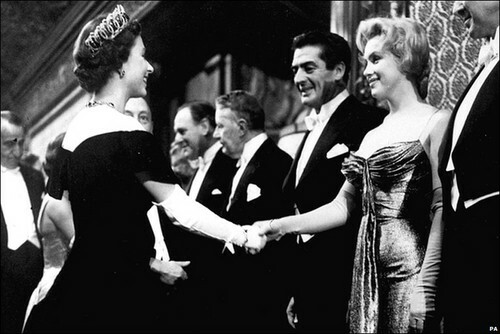 Marilyn Monroe meets Queen Elizabeth II, London, 1956. . HD Wallpaper and background images in the Ratu Elizabeth II club tagged: elizabeth queen ii. This Ratu Elizabeth II photo contains saman perniagaan and sut perniagaan. There might also be saman pakaian, pakaian penuh, jas berekor, ekor kot, ekor, tali leher putih, tali leher putih dan ekor, saman berpakaian, berpakaian penuh, tailcoat, white tie, and white tie dan ekor.